Do you know the difference between quality management system (QMS) and quality systems management (QSM)? Today’s guest is Larry Mager of Mgmt-Ctrl. He describes the difference between QSM and QMS, as well as offers tips on concepts that make medical device businesses more efficient and effective to benefit patients. Challenges with management control include the different definitions of quality management. Most organizations define it too narrowly and passively. QMS documents processes, procedures, and responsibilities to achieve quality policies/objectives. For Mgmt-Ctrl, QMS includes quality operations and QSM. The QSM solution is designed to measure, manage, and improve the quality of products/processes. Companies focus more on compliance than quality due to costs. Predictive analytics extract info from data to find patterns that may predict outcomes. Company’s executive team and person responsible for regulatory compliance (PRRC) are responsible for measuring and confirming process/product quality. Medical device companies need to be proactive, not reactive. And, they need to understand management control terminology, such as product and process. Design and development process has not focused on critical quality controls or reviewed released products against those controls to make adjustments. A medical device that’s a software component must be controlled and managed appropriately within a quality system. Jon Speer: Alright, so what's the difference between quality management system and quality systems management? I know it seems like the difference might be subtle. Same words, different order. Yeah, I get you. But there is a difference and one really is about being proactive, it's about managing your business in a much more effective way. 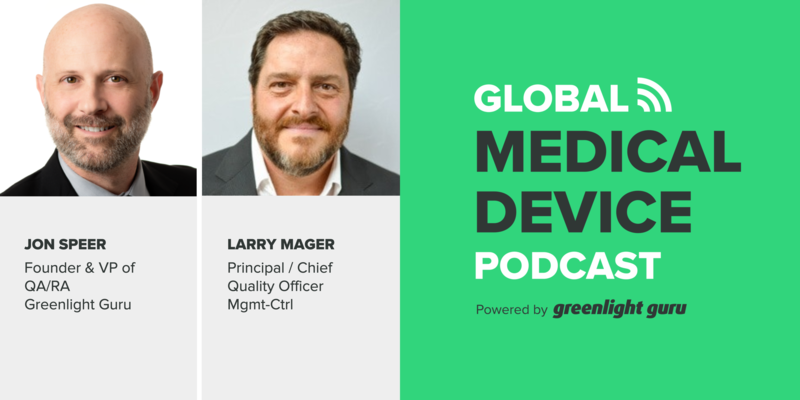 Really excited about this episode of The Global Medical Device podcast where my guest, Larry Mager, who is a principal for a company called Management Control, Mgmt-Ctrl. We dive into the difference between QMS and QSM. And then also I'll give you a few tips and pointers about how you can employ these concepts and principles to better run more effective, more efficient businesses, where the patient will benefit. 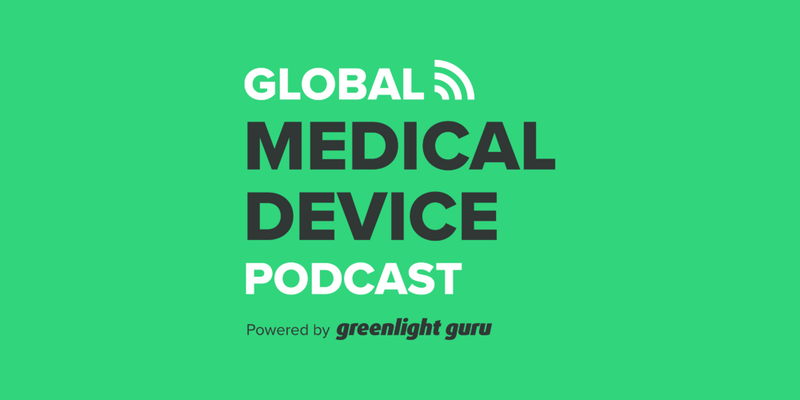 Jon Speer: Hello, and welcome to the Global Medical Device Podcast, this is your host, founder and VP of Quality and Regulatory at Greenlight Guru, Jon Speer, and I'm really excited about today's conversation. With me on this I have the principal from Management Control, Larry Mager joining us. Larry, welcome. Larry Mager: Thank you, Jon, good morning. Jon Speer: Now Larry, good morning. And you and I have had quite a few conversations over the past, well, several months. And really, it's about this idea or this notion about really improving quality systems management. And we're gonna talk a little bit about that today and I want people to know a little bit more about what you're doing now with Management Control. And folks, go to www.mgmt-ctrl.com to learn more, but Larry, tell us a little bit about what you're doing with Management Control. Larry Mager: Sure. Management Control was really founded on basically that concept of Management Control, but primarily, on the desire to affect change in terms of how people look at the quality discipline of quality management. Jon Speer: And in your experience, when you interact with companies and I know we're gonna talk a little bit more about this today but what are some of the challenges? Obviously, you started Management Control because you see that there's an opportunity to help, but what are some of the biggest challenges that you've seen with the way companies handle this topic? Larry Mager: That's a great question. The one thing that I see is everybody is all over the map, even in terms of how they define quality management and some organizations define it, I think, far too narrowly and far too passively. So as we define it, we start off with really, you take the definition of the quality management system that ASQ puts out, which is that quality management system is a formalized system that documents processes, procedures and responsibilities for achieving quality policies and objectives. So it simply documents those things. And we expand quality management more in terms of two things. One is quality operations, which is the execution of a quality management system or adherence to that existing system, so the functional groups typically included would be QA, QC, QE, and then the other discipline within quality management is something that is not well addressed and that's what we're really trying to focus on in addressing, which is this concept of Quality Systems Management, QSM. So quality management systems is composed of quality operations and quality systems management. Jon Speer: Okay. That makes a lot of sense. And folks, I know it can get a little confusing because obviously the same words are used, but just at a slightly different order, but the context is really important. And Larry, when you talk about quality systems management, I wanna reiterate, this is about measure, manage, improve. Larry Mager: Absolutely. So this makes it not passive. It is active. The quality systems management solution that we espouse is to measure, manage and improve the quality of products and processes, inclusive of addressing the cost of poor quality for organizations. Jon Speer: Right, yeah, and so I think this is... You know, and you and I have chatted recently. One of the areas that I think that companies struggle with is like cost of poor quality, for example. I guess conceptually, I think we can wrap our heads around, yeah, poor quality is expensive, but in practice, that's a really difficult thing for companies, it seems to be anyway, for companies to put the appropriate measurements and management and improvements in place to truly get a handle on that. Do you have any thoughts on that? Larry Mager: Yes, it has been difficult. The quality profession typically has not done a good job of addressing that. Primarily they've been more compliance-focused than I think quality-focused. And when you take a subject of basically the cost of poor quality and you start to look at that, you start to be able to break that up into the same concept of managing the quality of products and the quality of processes. So what we've really done is be able to take these things the quality measure, the quality of products, measure the quality of process and then also look at the cost of poor quality and really approach it from what is a predictive analytics model. And let me define that too because predictive analytics is something that when you start to look for the definitions out there, what people say, again, it's all over the map. So our view of predictive analytics is the practice of extracting information from existing data sets to determine patterns that may predict future outcomes and trends, if and if is the big word in this sentence, if nothing is done to change the underlying fundamentals that are driving the data, thus the bigger picture goes back to measure, manage and improve product and process quality. Jon Speer: And I wanna dive into that compliance angle for a moment because as you know, we've done a lot of work with FDA, CDRH, and the Case For Quality, trying to promote that program, and this is one of those things where the Case For Quality seems to be beating that drum a bit on... We've been, as an industry, we've been too focused on compliance and we need to shift our focus to be more quality-oriented. Again, and conceptually, I can wrap my head around it, but in practice, that gets a little bit tricky and especially how do I measure that? And one of the things that I've seen throughout my 20-plus year career is a lot of companies do a pretty good job of setting KPIs or different metrics for different processes or different aspects of their business, but they do seem to be very, very compliance-oriented in what we're measuring. And I think this is what I've interpreted that behind... A big part of the FDA's message is that, "Hey, industry, we need to sort of re-evaluate how we're measuring our products, how we're... Re-evaluate how we're measuring our products and processes, and everything that goes into the management of our business. And I think this is really sort of the foundation of what you're trying to do with Management Control and with quality systems management. Larry Mager: Yes, that's very accurate. I think the shift from a focus on compliance to a focus on quality, little Q, is exactly what the Case For Quality initiative is trying to affect. We have developed basically a measurement structure, which as you said, is foundational. If you're going to manage something, you have to measure it properly, and if you're going to improve something, it has to also come from good measurement and effective management of that information. So what we have done is not only create a suite of measures that we believe are patient-centric and in support of the the medical device quality and safety initiatives, that not only Case For Quality, but also EU MDR are embarking upon, we have a suite of metrics that is also capable of being what we call our standardized, capable of standardized measurement and why that is important is because we can apply these measures top down, so they're not the same as KPIs. Larry Mager: They are a group of measures for product processing, cost, support quality that can also be managed in focus of product, managed in focus of QMS processes at the different levels inside of a company and managed across an enterprise that might have multiple quality systems and multiple different ways that they currently measure and manage themselves. So our standard, our measurement foundation creates that standardized suite of measures that enables an organization to better understand their constraint and what to target at the varying levels and across the enterprise. Jon Speer: Alright, so really what you're all about here is, and I guess help me with this and help our audience with this, who should care about quality systems management within an organization? And it's a... I don't mean to be flip with the question, but I wanna be very crystal clear to the audience of why this matters, and who should be paying attention to this. Larry Mager: Sure. Well, first of all, the entire executive team. Management responsibility does go to the entire executive team but also the person who would be the head of quality or the chief quality officer must be looking at this, especially now in light of the new EU MDR, PRRC and that's Person Responsible For Regulatory Compliance, those requirements are all about actively measuring and understanding product and process quality, and confirming that before product is even released. So it's the executive team, it's the head of quality who is obviously supporting the executive team, but directly responsible and then anybody managing any group that has quality management system processes that they must execute and adhere to, they need to care. Because in this framework, the idea is if we're going to be able to measure it at those different levels, we're going to be able to better manage it, and obviously then it helps the organization better focus on improving those processes. And then finally and probably the most importantly, it all comes down to people, the people in the organization who actually execute those processes. They want good, compliant, effective and efficient processes within which they can do their work. Jon Speer: Yeah, absolutely, and I think sometimes when people hear something with the adjective of quality in front of it, they... A lot of people would just tune out and like, "Oh, I'm not part of the quality department and not really something I need to worry about." But that not... It's not the era that we're in today. I mean those of us who have been in this industry for a while, we've seen a lot of evolution on interpretation of quality management systems of course, but even if you're not in a traditional quality role within an organization this is an important topic, especially there've been documentaries on Netflix, there've been different websites and patient advocacy groups that have formed over the past several years, and it's all... And it's all pointing out problems with products, when this device goes bad and it's a terrible situation whenever a patient has some sort of adverse event. Jon Speer: And I think this is really why I think your approach is refreshing because it gives action to a company or sets the framework, if you will so that the company can take action to stay on top of this. I think we look at historically, specifically like FDA inspectional data, 43 observations, warning letters, almost always at the top of the list is CAPA. A big part of me believes that the reason for that is we're very much in a reactive state as an industry. We wait for things to happen, and that is just, it's a terrible situation to be in. So what can we do as a medical device company to be more proactive? And from the little bit that you've shared with me about Management Control's approach and the quality system management efforts, this seems to be a framework that a company can put in place to really allow them to be more proactive. Larry Mager: Yes, I absolutely agree. So again, this all goes into that terminology and understanding, people really taking the time to think about the terminology, but the terminology of Management Control. So you have a quality management system, you're supposed to manage the quality of product and process. So let's take product since you touched on that and you think about the concept that we touched on earlier that we're trying to go away from a culture of compliance and go to a culture of quality. So people who were in more of a compliance mode, if they looked at just the QSRs and I'm using that as an example, in 820.30 it talks about something called an essential design output and that is something that comes out of a design program and goes into a production operation. It is something, some aspect of a product that is essential to the function or safety of a device, right? Larry Mager: Well, that concept is never mentioned again in the QSRs. So if you think about the FDA and the findings and the data that you also referenced, there's no opportunity for organizations to be cited for not having placed critical-to-quality control in verification and validation activity in a production environment to better understand the quality of product and production process. So the reactive nature of organizations is to go back and do these remediation activities, and they can be boil the ocean type of activities and you always hear people talk about starting in with the design control process and doing a better job of transferring those essential design outputs. However, if you think about the patient, you think about those product quality issues in the market today, we really don't need to go back through that effort in order to look forward into the market and see exactly how those products fail. Larry Mager: And here, I'll reference actually the FDA enforcement guidance that was published on December 27th of 2016, so very recent, and it's the FDA's intention of enforcement, when they find quality system issues, it's called benefit risk enforcement and what they basically ask of companies is to first understand the benefit risk of your products, meaning, "Look in the market, what's going on with those products", and then how are you controlling that? And so I guess what I'm trying to say here is we can take active measures today if we're measuring properly product and process quality, we can take active measures today to take known harm or known high harm, wherever the line is drawn, and those failure modes, and come back into the production operations, and put critical-to-quality control in place and all by itself that will have an effect immediately upon the quality of the product going into the market. Jon Speer: Folks, I wanna remind you all, I'm talking to Larry Mager. Larry is principal with Management Control. Again, you can find more about Management Control by going to www.mgmt-ctrl.com. And of course this is Jon Speer, the founder, VP of Quality and Regulatory at Greenlight Guru. And what Larry's talking about quality management system and design controls, 820.30. Greenlight Guru has built an eQMS software platform specifically for the medical device industry, designed by medical device professionals. So if you wanna learn more about how our software can improve your... Not only your QMS, but a means to help you with your quality systems management, help you better manage essential design outputs and that transfer to production and manage all those events that go along with that, I would encourage you to go www.greenlight.guru and request more information. Jon Speer: Alright, so Larry, you mentioned something I think is really important here, you talked about 820.30, you talked about the essential design output and how the ideal behind this is, this becomes those critical-to-quality attributes or aspects of a product. And I've often talked about companies who have complaints or they have post-market quality events that in some respects that is kind of a measure or an analysis, if you will, of how well they do during the design and development process. Do you have any opinions about that? Larry Mager: Absolutely. And it's kind of ongoing from the thought that I just laid out previously that there has not been a good focus on what are those critical-to-quality controls in production? Likewise in my career, I've not really seen companies, save one, do a really good job at looking at product that is released against controls such as that, against the level of quality that they predicted based upon their risk system and controls, and make adjustments. And so, you also, you mentioned the complaints, the aspect of complaints, which were the failure modes coming back from the field, from the market. And how often do you see companies actively link market or product failure modes in the market, to controls in production and non-conformance codes, and actively manage that in a very similar way through both risk and Kappa? And the answer to that is, it's rare, to be quite frank, it's rare. And so we... I think we... In the medical device industry, we need to do a much better job at getting our hands on product quality and understanding that product quality in the market is only a reflection of process quality within a quality management system. Jon Speer: Yeah, it's a really good point of view, and I tend to agree with you. I see, here's sort of the perspective that I often see is like there's this mad dash or this rush to get through the design and development process, and you'll get that regulatory permission or clearance or approval, or whatever that regulatory pathway is, so that I can get through that hurdle and get to market, but there are... Honestly, there are some real subtle, and relatively, I'll say, easy things in the grand scheme of things that can be incorporated through the design development process. I mean things like design for manufacturability, that's a good practice. And there are other tools out there like Design for Six Sigma, good human factors, good process development. I think that's where we drop the ball as an industry, and I think we spend a lot of time designing our device, the product, but I don't think we do as good a job as we can be at defining or documenting, or designing really our manufacturing processes that go into building that device. I think there's that opportunity for improvement. Larry Mager: I wholeheartedly agree. I think Jon, I've... In our conversations before, I've recognized, you and I have sort of two unique focuses, areas of focus, maybe foci. You're very strong in the discipline of design and design control, and I understand that, and that's for the product for the future. So improving those processes so that they are more effective, obviously compliant, but more effective at getting the results that they need to have and more efficient in doing so, is very important for future product. Quality systems management strategy is one where it focuses more on product that is already being marketed and how do organizations work backward from the marketed product, if product gets released and affecting people today. How do they work backwards and get that control that they need to today and the concepts are similar. So that's where you and I meet in those... The idea of what gets transferred into production, how good are those production processes? And what you're touching on are really capability and stability. Jon Speer: Absolutely. And I wanna hopefully squash a myth right away for those listening who may be are in the Software As A Medical Device, they may hear the notion of production, and those sort of things, and then they say, "Oh this does... This topic does not apply to me because I have Software As A Medical Device, so I don't need to worry about all this stuff", what would you say to an SaMD company who may have that opinion? Larry Mager: That was back to the concept of what is a quality management system. Every single thing, everything that you have to manage the quality of your products and processes is in play, and if you have a medical device that is a software component that has to be controlled within that system, it has to be managed appropriately, just like a product. Jon Speer: Yeah, so folks, if you're in the SaMD space or you have software that's a component of your product, and... These principles most definitely apply to you. And frankly, they apply to any company of any shape and size, who is making a product of any shape and size. These are just really good business practices. This is about managing your internal quality, but the performance of your product, what happens when people use your product. I mean the whole goal of being a medical device professional, I think should be everyone's objective anyway, is to improve the quality of life. That's why we develop and design and manufacture medical devices is to have a positive impact on life. So, do take this seriously, regardless of your device type, regardless of your complexity, regardless of your classification, this will help, these principles will help you run a better business. Jon Speer: Yeah. So Larry, before we wrap things up on this conversation today, what other tidbits or key tips do you want the audience to take home with them today? Larry Mager: Well, I guess we really would like them to sit and think about the concept of a quality systems management strategy to better manage the quality management system, and the concept of management really gets into the measurement, monitoring, reporting and review of the product and process data that is utilized to create the information necessary and in the way that it's standardized and stratified across the organization, because then it comes down to, so measure, manage and improve. You get to the place where, if you can turn your data into actionable information, then you can manage what you need to and identify your constraints, whether it's a constraint in compliance, effectiveness, efficiency, or critical-to-quality control, cost, support quality, you can identify those constraints and you can get into an active improvement cycle and a focused and targeted improvement cycle, and it'll bring sanity back to your organization. Larry Mager: There are way too many remediation programs that're enormous and not well-defined strategically, also in my opinion. And so, for example, if you've gone through a remediation strategy, and it only addressed the compliance of your quality system, but it didn't address the effectiveness of the processes or the efficiency of your business, you actually have a bigger challenge now to unwind and ensure that these processes work for your business. So it's a complete cycle and I would urge people to really think about, what is the approach? Jon Speer: Yeah, and I would as well. And that remediation is a good example, and that's another case where oftentimes we are reactive as an industry, we wait for the non-compliance issues to rear their ugly head in the form of an FDA inspection or an ISO auditor, or something like that. And then our actions are largely compliance-oriented, but we have an opportunity and I would encourage you all to not wait for those remediation events to surface. Take action now, because this will, again, it'll help you. I know I sound like a broken record, but it'll help you run a better business. And Larry, as you were chatting, I was thinking of one other scenario that it's pretty common in our industry today, where a company, they may have the IP, they may own the design responsibilities, but oftentimes they'll be working with maybe a third party resource in the form of a contract manufacturer. And I've even heard some companies say, "Oh well, I don't have to worry about my QMS because I'm outsourcing that to my contract manufacturer." For companies that have that mindset, what would you say to them as some advice? Larry Mager: They own it. The executives in that company have the responsibility to make sure that it works well, and I would love to have this conversation further with people because it gets into the supply chain management but... So here's the way I say it to people, if you consider the manufacturing that others are doing for you, it's no different than if you were doing it internally, it just happens to be done at a different location, but if it's contracted by you, you own it. And these concepts that I've talked to and if you look into EU MDR and the responsibility as an EU MDR, the responsibility to control the quality at your supplier or your contract manufacturer, you own those. So understanding if you have a critical-to-quality manufacturing process, or quality attribute of a product that is being done outside of your walls, you need to manage that and manage it more actively. Additionally, I would say from a business perspective, and we didn't touch on this enough, although we talked about cost of poor quality, you might be gaining a cost from... A cost-benefit from manufacturing externally, and I hope you all are. I hope people do. But if you don't manage that, that could turn into cost of poor quality very quickly. So you have to have a relationship, you have to be in control, you have to own it, you're responsible. Jon Speer: Yeah, I can't say it any better, folks. And I think oftentimes or sometimes anyway, you may be... You have this great idea for a new product and you may take it through the design and development process and at some point in time, you wanna transfer the manufacturing responsibility to a third-party resource such as a contract manufacturer. These are table stakes to being a medical device company. It's, you're an executive with that company, as Larry said very well, you ultimately have that responsibility. So keep your finger on the pulse. Be engaged, be involved throughout this process. So Larry, just to kinda wrap up the conversation today, any other content or information, or guides, or information do you think would be helpful or places that you can point people to learn more about what you're doing in Management Control, and your quality systems management initiatives? Larry Mager: Well, obviously, I would encourage people to reach out and let's talk about this, talk about their needs, but I think the organizations that are going through the EU MDR transformation initiatives, they need to think less in terms of checking the box to meet requirements and more in terms of getting control of product and process quality. And then the only other thought I would have is I want them to think about the concept of the stakeholders. The ultimate stakeholder is the patient, and the patient is what the medical device industry serves in the healthcare industry. And if you think about the regulatory stakeholders, that's their ultimate constituent as well. Larry Mager: So I would just encourage people to think about the concept of a quality systems management plan to augment their quality management system structure. And I know, as Jon said earlier, it's confusing, but it's real simple. A quality management system, no matter how it's defined inside of a company, is passive. And there are much more active things that can be done to manage that, and I would encourage people to really think about it because the stakes are higher, the healthcare industry is starting to be more punitive in not allowing poor product into the market. As the payer systems get better, it's time for quality management to take three steps forward inside of the medical device industry if your company is going to stay viable in this industry. Jon Speer: Alright, thank you, Larry. And folks, I wanna remind you all to go check out what Larry and his team at Management Control are doing. Again, you can go to www.mgmt-ctrl.com. There's some really great content information. They have a great blog speaking of patient-centric. There is a really great post that Larry wrote a couple of months ago on patient-centric ecosystem. I'm gonna encourage you to check that out. And if you have any questions for him, feel free to reach out. I think a good email address is info@mgmt-ctrl.com to learn more about what Larry's doing, and how he might be able to help you. Jon Speer: Again, I wanna remind you all, a quality management system is also foundational to running of a business, and it's more than just the quality function who has responsibility of this. So we've built the Greenlight Guru eQMS platform to help you manage your business in a more effective way. We have workflows that are built into the platform. Again, this is designed specifically and exclusively for the medical device industry. So go to www.greenlight.guru to learn more about the Greenlight Guru eQMS. Jon Speer: Once again, this is your host, founder and VP of Quality and Regulatory at Greenlight Guru, and you have been listening to the Global Medical Device podcast.